So lovely! 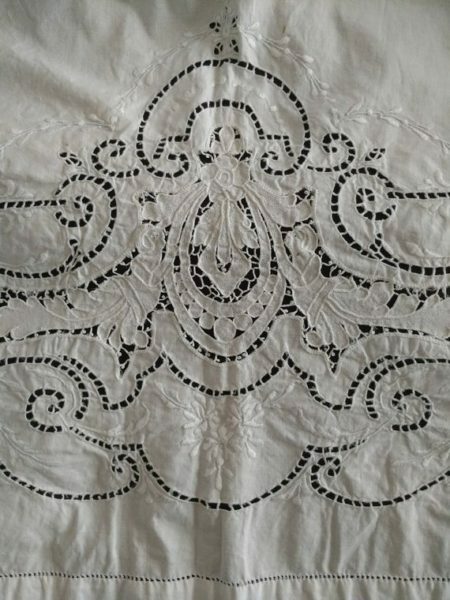 An early 1900’s Victorian or Edwardian (probably Italian) white bed sheet with fancy work Appenzell embroidery and cutwork. This needlework is the full width across the one end of the sheet. Made of nice quality cotton and linen fabric (metis), it has a wonderful feel. A design of scrolls and ovals is filled with embroidery of flowers, tendrils, and ladder work cutwork, throughout the fancy work part. A gorgeous addition, to add a touch of old, to your bed linen decor. Lovely piece of vintage home decor.